Fall is here and with that comes pumpkin spice lattes, chunky knit sweaters, and the leaves turning that beautiful burnt orange color we love more and more each year. A new season also means updating our home decor and bringing those beautiful shades of autumn indoors. 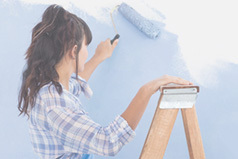 Here are a few decorating ideas to get you excited about the change of season. 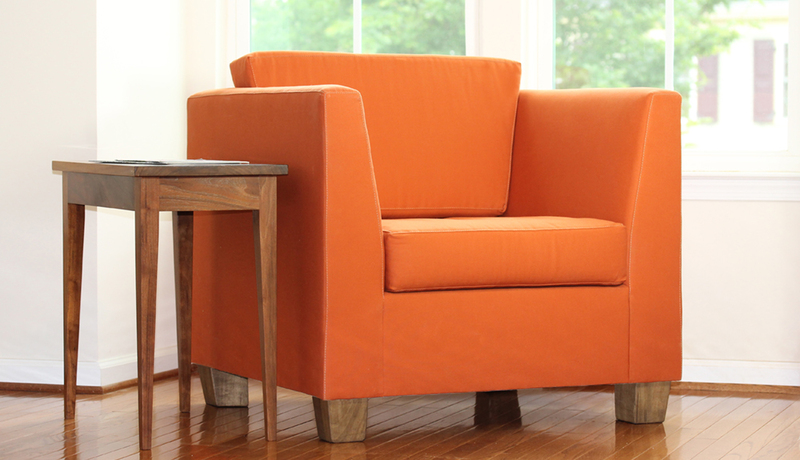 Add some pop of color to your home with a fall color palette of deep oranges and dark browns. 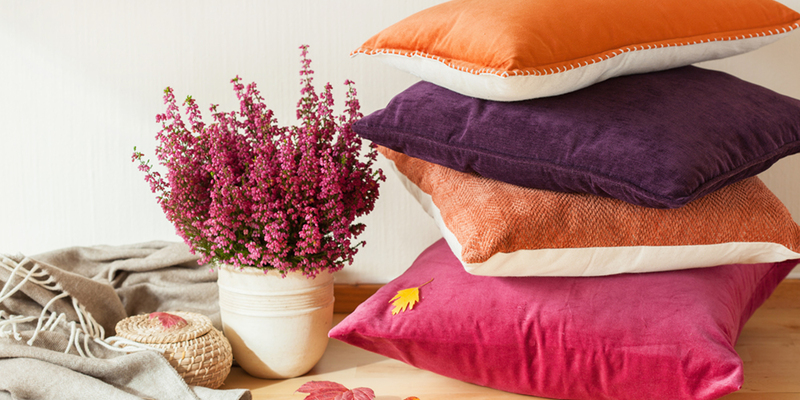 An easy way to do this is switching out your usual throw pillows for more autumnal ones. When adding fall decorations of any kind, we always recommend thinking about where the item came from. Purchasing an item that was made responsibly or is second hand is always better than buying something mass-produced with a questionable manufacturing process. 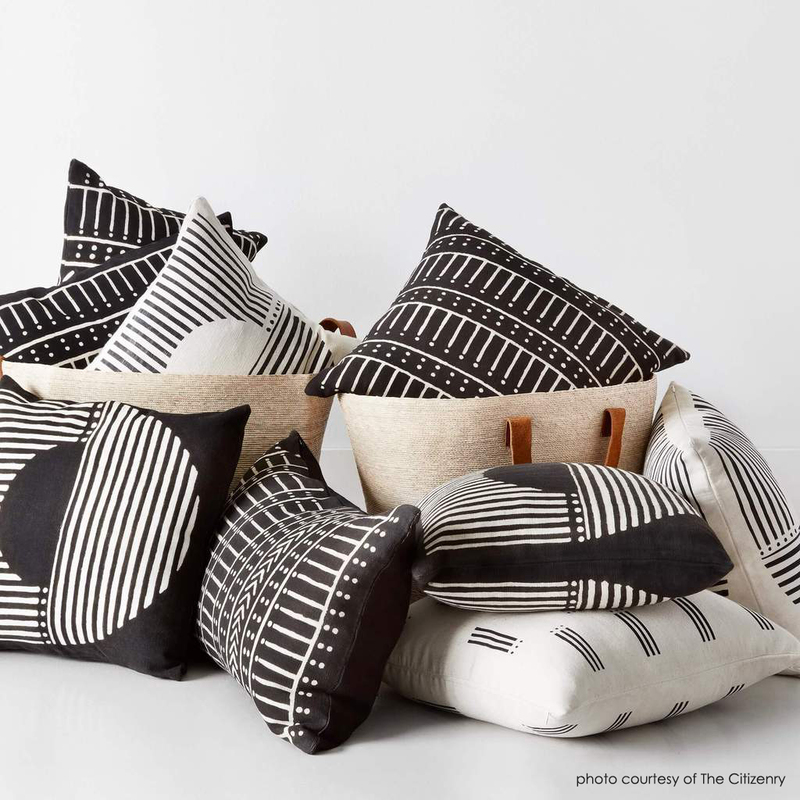 These throw pillows from The Citizenry are not only ethically-made and handcrafted but they’re also unique and eye-catching. 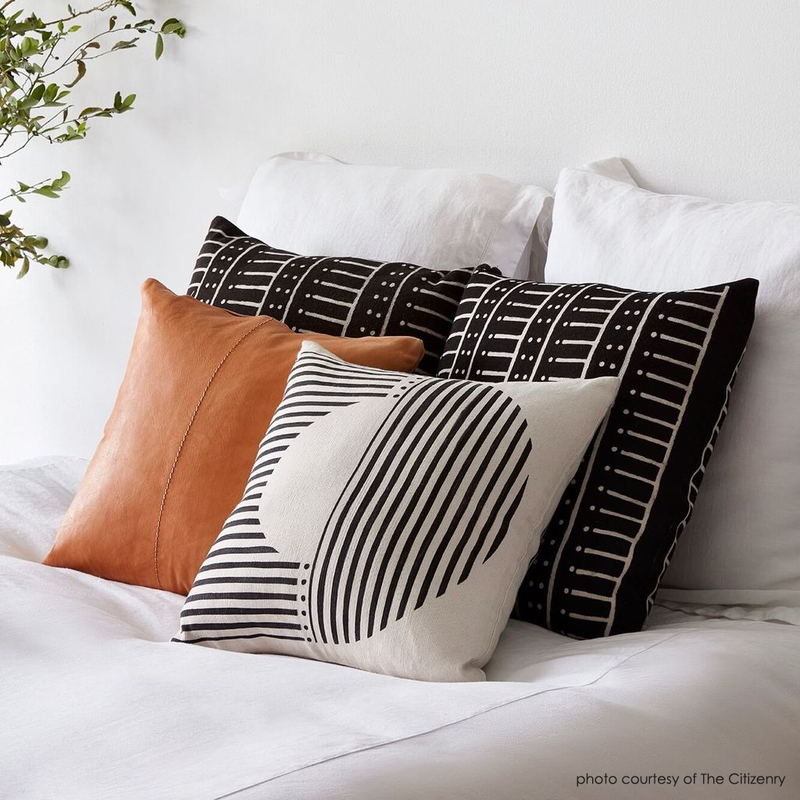 We’re particularly obsessed with the Etoile mud cloth pillow made from hand-spun organic cotton. 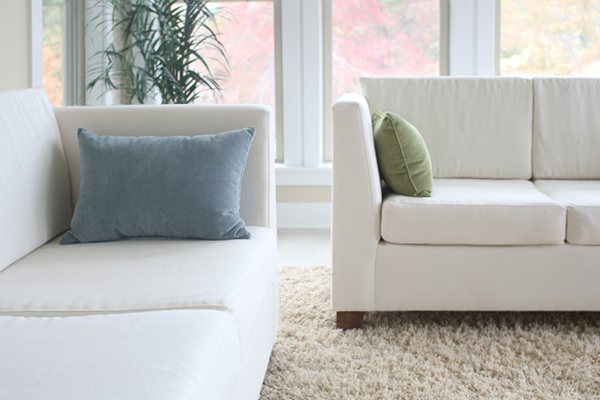 If you’re looking to invest in pieces with the intent of using them all year round, a rug is a great place to start. Dramatic red rugs can be utilized through all four seasons. Opting for a vintage rug is not only eco-friendly (you’re repurposing something that already exists) but it also tells its own beautiful story. Perhaps it lived an edgy life in the 1960’s or it’s much more old school and dates back to the turn of the century. Etsy is a huge hub for vintage finds. The Ethical Home has a vast array of one-of-a-kind rugs. Pro-tip: you can also find lots of vintage rug stores on Instagram! That’s where we found Alex & Oz Antique Rugs. Finally, if you really want to go all out (and we know you do) then our organic armchair in sweet potato is the epitome of fall and can once again be loved all year round. Made of natural Talalay latex, organic fabrics, sustainably-sourced maple, and zero-VOC stains, this furniture piece is both healthy and festive. Not sure Sweet Potato is for you? We have more neutral shades as well. 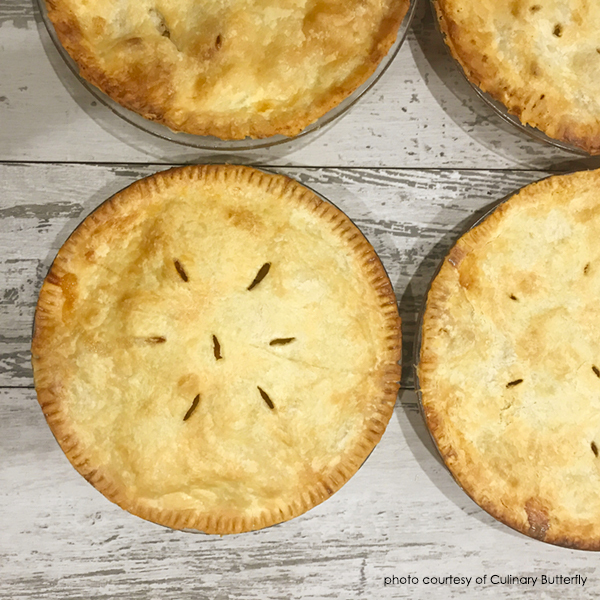 Okay, so we’re not saying you should actually decorate with pumpkin pie but fall is the season of delicious pumpkin treats so why not fill your kitchen with the aroma of freshly baked sweets? 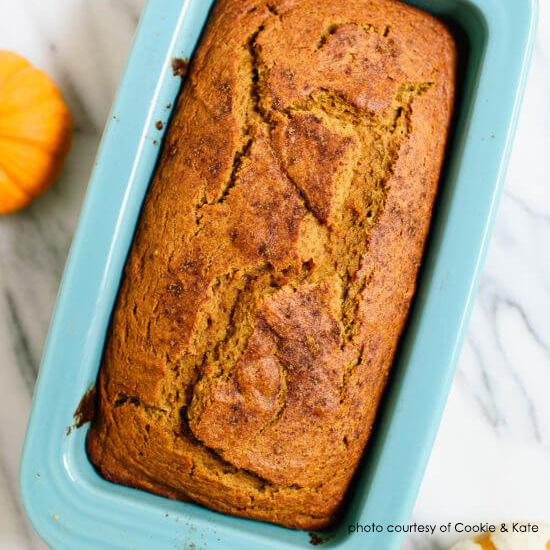 Baking not only results in a tasty treat but it’s also a wonderful way to bond with children. Kids love learning new things in the kitchen! 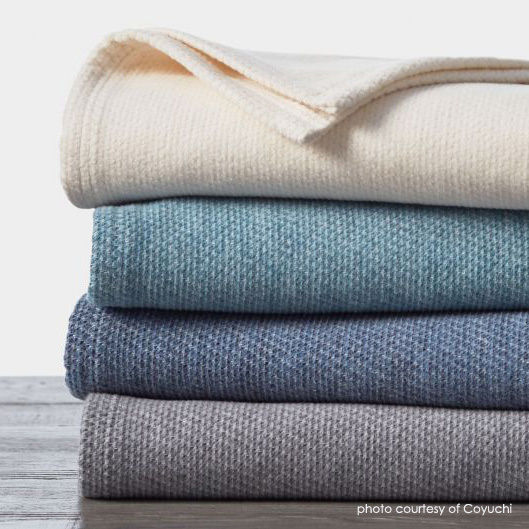 A chunky knit throw or blanket on your sofa or bed adds both comfort and color to the space. We, of course, recommend opting for an organic blanket. 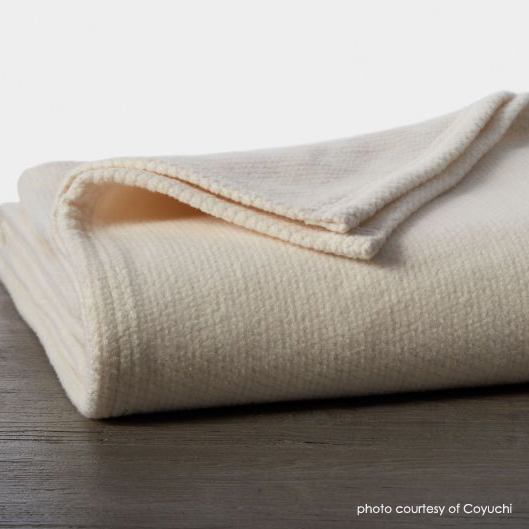 This one from Coyuchi is GOTS-certified organic and machine washable. We also recommend adding a wool duvet to your bedroom. 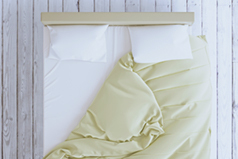 Changing the duvet cover is an easy way to add some fall shades to your bedroom. Don’t have a duvet insert? We offer both a natural and organic version. Fall reminds us of rich woods, whether small decor pieces or timeless furniture. An easy and inexpensive addition to your home is wood coasters. There are plenty of reclaimed wood coasters that could use a new home and will stop you from getting rings on your coffee table! 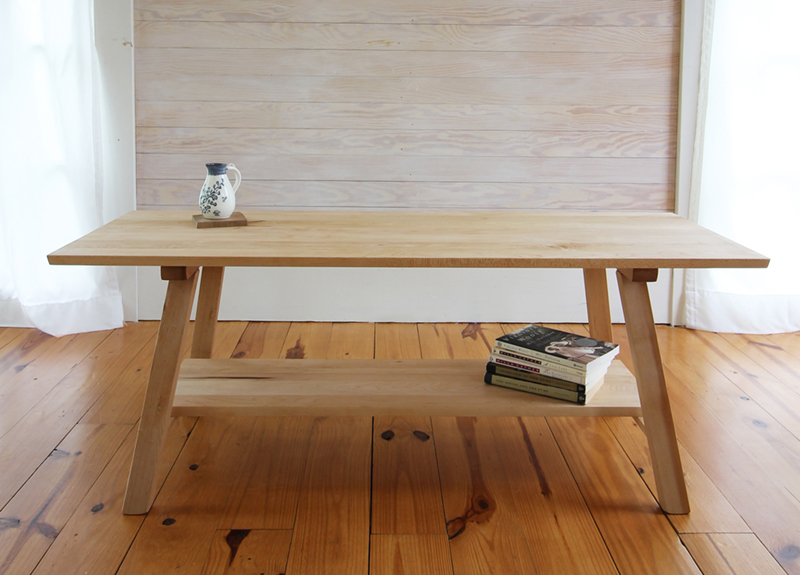 On that note, if you’re looking for an investment piece that can be used throughout the year, treat yourself to a sustainably-sourced maple coffee table or bench. Made in the United States with zero-VOC stains, these are classic pieces built to last for generations. We hope you’ve found some inspiration here. Happy shopping! Take a closer look at what it means to be eco-friendly. A few key points to keep in mind when searching for your cozy oasis.